When we first meet Mads Mikkelsen's character, the sole survivor of a plane crash in the Arctic wastes, he's already been in need of rescue for quite some time. He is soon forced to leave the relative safety of the plane's wreckage and head out on a treacherous and exhausting trek in search of rescue. Arctic is a slow-paced movie, largely free from dialogue, carried solely by a great performance from Mikkelsen. His journey is as exhausting to watch as it is beautiful; the simple man-against-nature story providing plenty of gorgeous backdrops. 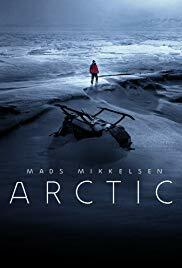 It might be draining viewing, but Arctic would be worth recommending on the strength of Mikkelsen's performance alone. Basically, Mads Mikkelsen is stuck in the snow for a long time. Despite that, he delivers an incredibly warm (hehe) and quiet performance amidst the stunning and challenging backdrop of the arctic. You'll be struggling to breathe the whole time.